Docky Update – Active Window What? Intellihide is by far my favorite new feature. Its kind of a hybrid autohide mode for docky that determines if it should be hidden or not at the current moment. It works by tracking the currently focused window, if the focused window is obscured by docky, it hides itself, otherwise it is visible. It is slightly more intelligent than that however, it keeps track of child windows and “sister” windows and treats them as a group. Things feel natural with it, even when working with multi-window applications like the GIMP. There is a lot of fun in the works. There are a lot of fun things we can continue to do with Docky to make it better, faster, and more useful. Some of these will be quick and easy, some of them will be slow and someone revolutionary. The next version of Docky is going to be AWESOME. Fine, have it your way… GNOME Do will sport a straight GTK+ panel applet interface for the next release. Do you feel better now? 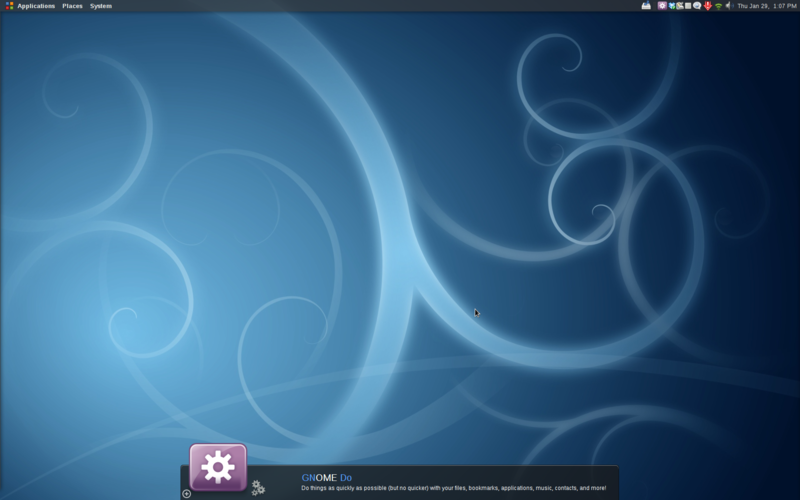 Now GNOME Do can be as boring as you are. edit – I have been asked to provide a small bit of rationality for this. The reasoning is quite simple. GNOME has a long history of having issues with applications that dont follow the HIG or do not look like other GTK apps. Even if they look better. We can kill two birds with one stone by doing this and maybe go up for inclusion in GNOME. 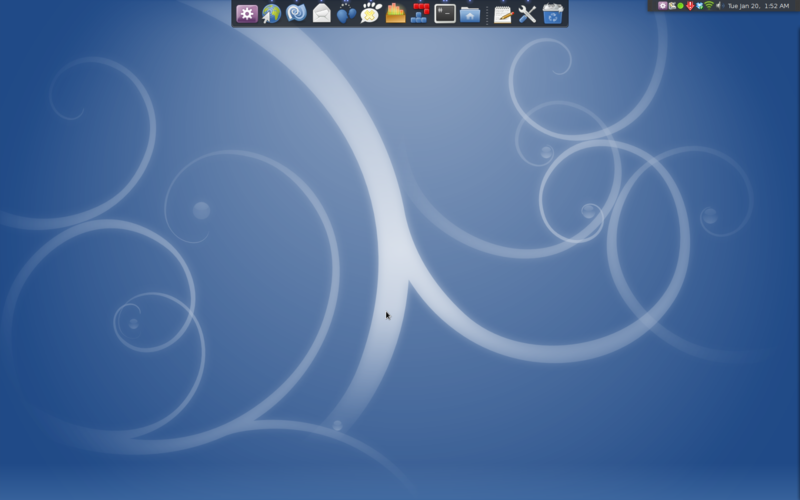 So I have been hacking on GNOME Do and lately Docky for hours and hours of my day to day life lately. I am slowly picking up on a couple truths about software development. I am sure I am not the first to realize this, but I am going to document them here for my sake and maybe any poor soul in my position. 1 – Simple fixes aren’t. Try as hard as you like, the fact of the matter is that you will rarely, if ever, implement something the first time perfectly with 0 bugs. Additionally, the closer you are to release, the more likely you are to make mistakes. This is not just murphy at work, this is also due to the fact that you are worried about release and getting things out the door properly. It makes you sloppy. 2 – Never write code with excessive dependencies. There are always at least two ways to write any piece of code. There is a quick and easy way, and a longer, harder, more thought out way. Sometimes it can be very difficult to figure out which is which, but I have found a trick. The method that relies the least on the other parts of your code will tend to be the best way. In short, find dependencies, eliminate them, be happy. Sometimes it can be very very hard to notice your dependencies, but there are some big offenders. Anything to do with the word singlet. 3 – If you don’t know how to do something, sleep on it. If you are at all like me, your brain doesn’t stop just because you have. Sometimes it is useful to implement something wrong and then see its wrong and do it right, most of the time however it is not. I have in the past run into situations where I was not sure what to do, so I picked one of many options, got it wrong and felt stuck with it. As time has gone on I have tried to go back and fix those, but there are a lot as they do accrue over time. I find now in these situations that its best to just put things down, and let your brain mull it over for a while (don’t even actively think about it, you will have it come to you). Sometimes I will talk it out, like a crazy person, but hey it works. In the end you will still get it wrong from time to time, but at least you will do better. 4 – Do something more than program with your computer. Programming is fun and rewarding, but you must do other things with your computer. If you never use it for anything else you will suffer from several things. Not the least of which is losing your ability to type fast. Sure you can touch type, but your hands vocabulary goes to the shitter. Write blogs, or articles, or documentation, anything that requires actually writing full complete sentences in your native language. Never let a day go by without writing a proper sentence or 20. That is all for today. I hope to get more blogging done in the future, I find this fun once I get into it. It has been about a month since our last release and its time to follow up on all those bug reports and close them all. Tarballs are available for both core and plugins. Please note that while 0.8.0 plugins will work with 0.8.1, it is strongly suggested that you upgrade to get the best experience, especially for Docky users. Some quick statistics. Additionally Docky has recieved a major overhaul based on all the feedback from the 0.8.0 release. Here is what it looks like now! Docky has received a minor visual refresh, and a clock! Docky no longer differentiates window items from launchers in any manner. They are all merged together. Items can be pinned to the dock simply by dragging them to the left of the other transient launchers, making them permenant fixtures on the dock. It’s never been easier to add running items to your dock. Launcher matching is now much more robust with only prism and open office being the known remaining issues with it. 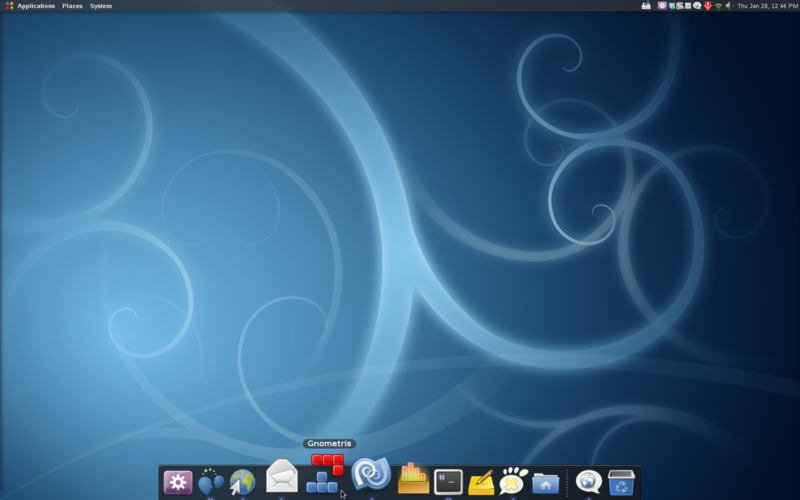 Hundreds of linux applications have been tested and confirmed to work. As more testing comes in this will become even more robust. Right click menus no longer have a remove from dock option, use drag off to do this. Cannot drag off items that have running windows attached to them as this presents a conflict of ideas. There is a clock! And if you click it… something magical happens. See what others have to say! y en español! Since my big contribution this time has been in the UI area I figured why not do a full walkthrough of the new Docky. 56k people beware, the images are full desktop shots to provide a real perspective on how Docky will look on your system. Docky is a dock of sorts. It has a fisheye zoom similar to what is Cairo Dock, launchers, window tracking, standard features of almost any dock worth its salt. However Docky is more, and we will get into that later. What is important about Docky is not so much what it does but how it does it. Docky was inspired partly out of the need for a class project (college student) and partly because I felt every dock on Linux did one thing or another wrong. From the start I felt Docky had a chance to do a lot right where things had been done wrong with Docks in the past. So I decided to focus on a couple key points. Make a dock so simple a 5 year old can use it. Drag and drop for everything. Add/remove launchers, rearrange, trash bin, drop files into folders, everything. No configuration UI. If there is a need for a separate UI to configure Docky, it is probably not needed as an option. Dead simple resizing, just grab the handle and drag. Extreme simplicity and easy of use. Be intuitive. Launchers are applications, not windows. Stay out of the way. A polite, one time request, is all that is needed. Most of these goals are acheived, and for a first release I am pretty happy with it. Docky sports every basic feature I have been missing in my docks and then some. There are obviously still interactions that need to be worked out, otherwise there would be no point of working on Docky. However, I feel at the core of it, Docky is ready for prime time, and I am proud to ship it! Consider this a 1.0 release of Docky. Well it is but a dock after all, if not the newest player on an already too large field of Docks on linux. However from the start, it was clear that with my background in GNOME Do, and my desire to make it part of Do, that Docky could be a lot more than just a dock. There are probably hundreds of Docks for every OS out there by now, some of them more animated than others, but they all work in a pretty similar way. 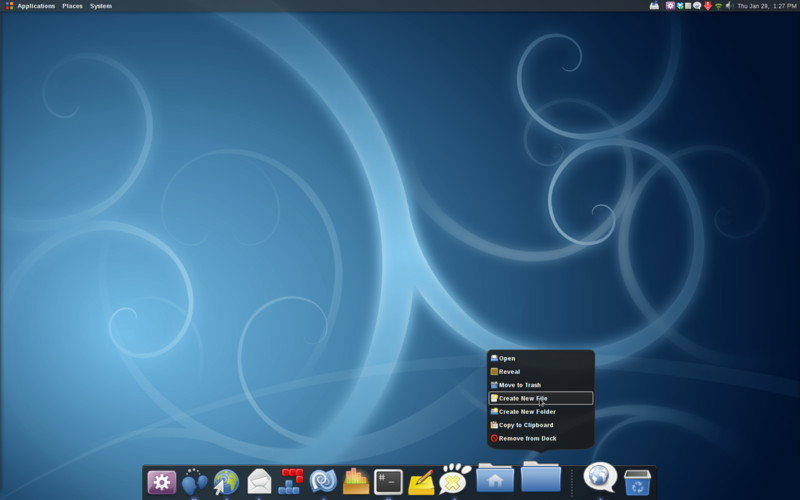 Take icon from menu | nautilus | konqueror and drag onto dock. Click icon on dock at later time, has the same effect as clicking it in whatever source you dragged it from. Icon now acts as “base” for windows of that application. There are things like applets, and sometimes really shiny things like stacks, but the idea does not really change at all. There is nothing new being done with the concept, just logical extensions to it. So when as a team we looked at this set of actions it became clear that steps 1 and 4 leave a lot of room for improvement. Why do I have to drag things onto the Dock? I mean I launch everything from there, it knows of all the applications I use, it should be able to put two and two together and figure out what to put on the Dock. Additionally, doing this repetatively is kind of annoying to set it up. So there was a tiny ah-ha moment, and it became clear that GNOME Do already knows what applications you use most. Not only does it know what applications you use most, but it knows what music you listen to, what people you talk to, what bookmarks you use the most. Why not let GNOME Do add some of these to the Dock? Obviously we wont remove the ability to manually add and remove things from the dock (you can even manually remove these automatically found items from the dock in the same way), we just augement that with the ability to have a Dock that is more adaptive to who you are. Making Docky a First Class Interface for GNOME Do. Docky is GNOME Do, really! Docky needed to be part of Do to make it work, so we had to make it summonable. Summoning and working with Do is no different than any other interface for GNOME Do (oh and there are a lot now). Further, when in “Summon Mode” as it is called, Docky can add any item to the dock provided the dock supports hosting it. That means, for the most part, no actions as they make little sense on the dock. In fact there are many ways to add items to Docky. Drag the left and right edges of the dock outward to add more items from Do’s statistical guesses. Clicking the “+” button when in summon mode. Any of these will result in Docky adding an item to the dock that functions as expected. By being a first class citizen of GNOME Do, we can do things that no other dock can, and we can do a lot of things other docks do better. There is always a lot of fuss about these things. Some people insist we do not need another dock for Linux, but I think what they mean is that we do not need another half finished dock. With that in mind, Docky will continue to progress and improve, bugs will be found and quashed, and the experience and simplicity will improve. We will be done when there is nothing left in Docky to take away, when every feature has been scrutinized and reviewed intensively. Docky has some odd interactions with summon mode when zoomed really small. Docky can get in the way of drag and drop when not autohidden. Docky is getting almost all of my programming attention these days. I figure now is a good time to give a general update about what is going on and what my plans for the future of Docky are. I figure the easiest way to break up this post is to internal changes and user facing changes. This way we can keep the interest of those who wish to write plugins and allow those who just want to see the shinies to skip ahead. Docky is going through a little bit of a rewrite internally. I am trying to clean up some of the architecture of Docky that evolved in a less than desirable manner. First though, a tiny bit of background on the design of Docky. Docky started off as a project for a GUI programming class I was taking here at Western Michigan University (I am but a student after all) and kinda fell into what it is now. As such, some of its initial design decisions were good, some of them were really bad. I did get an A however. The good things include Docky’s decision to do all of its drawing in a single Gtk.DrawingArea (big performance win here) and do all of its rendering based off of timestamps instead of relying on GLib Timeouts to give good accuracy. This means that Docky animates in a constant time across all systems, and the only performance indicator is the number of FPS the user sees. This is different from every other dock I have used (I am not sure about Cairo Dock here) and turned out to be a good decision. Really I was just guessing. However, in the original design there was very little separation between the Summon mode of Docky and the Dock mode that they were essentially inseparable. One could hardly exist without the other and the rendering code for all of that was custom done to accommodate this. Essentially, Docky was impossible to extend and add new modes to without custom casing in each new mode. This is not what I desire. Additionally, much of the classes had become muddled together, each containing references to their parent class and passing that on to sub classes and so on. This became a big problem for debugging and made it very difficult to make serious changes to Docky without breaking things. So I fixed things, or am fixing things. In my polish/breakage branch things are in a much different state than they are in trunk. The primary drawing area has no concept of what Summon mode is, this is all handled through a service that allows arbitrary plugins to register as painters for the Dock. There are services to provide functionality within Docky, a service to interact with Do, a service to do Text rendering (very important even though it sounds simple, but this helps keep things consistent), and a service for interacting with and adding items to the main Dock interface. This way applets, when the API is finalized, will be able to do all these things without having to have crazy implementations or initializers or anything like that. A common request for Docky is applets. It is coming! Let me give an example of how code looks for them right now. The simplest applet imaginable (just an icon and text) is done like this. Easy huh? There are of course methods you can override to provide additional functionality. You can override methods for click events, drop events, (soon) scroll events, as well there are easy ways to request your icon be re-rendered should you desire that. You can also implement things like a dock overlay renderer (no example code here) that will let you do things like a “Summon Mode” to display whatever information you need to display in a nice format. This could be especially nice for plugins to handle things like intercepting system messages, or doing a system tray (fun), or god knows what. I thought a nice sample that does a weather applet will be my example for this when the time comes. Applets will be installed in the same way all Do plugins are, by simply dragging the DLL right onto the preferences window. This will make it nice and easy to install and remove applets from Docky. Implementing custom right click menus is also just a couple lines of code. It’s just an additional interface you implement on top of BaseDockItem to add a right click menu. Takes 2 minutes tops. Some new things are going in to Docky after the 0.8 release that users may find interesting. The drag and drop system has been revamped to give better feedback. The fisheye algorithm has been worked and changed to use double’s instead of int’s so it is smoother now and less “jittery”. In fact I dare say there is no jitter at all anymore. Rendering speeds are improved so that netbooks should have a better experience. I doubt I can get it liquid on them, but I am aiming for it anyhow. Maybe once I switch to glitz? Oh yeah, there is one more change. A results list! People have been requesting this pretty much since the start of Docky, and it’s going to happen at long last. I will post screenshots sometime when I get less lazy. So i have not blogged about Docky at all. Partly because I didn’t want to, partly because I couldn’t. I guess this blogging thing isn’t exactly what I like to do. As it happens, I do have something to share though, however I don’t have much to say about it. So in short, here it is. Everything is pretty self explanitory. Docky can sit at the top of the screen too. It will be able to sit at the sides if anyone can present me a mockup of summon mode on the left or right side. Everything I come up with is too ugly to ship.